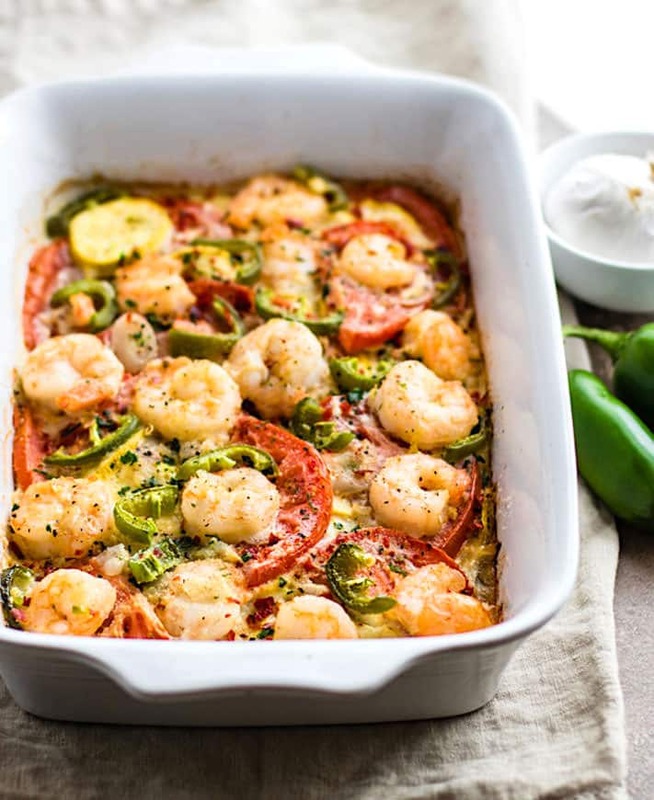 This veggie bake with jalapeno shrimp is low carb, grain free, and an easy recipe you can make in under an hour! 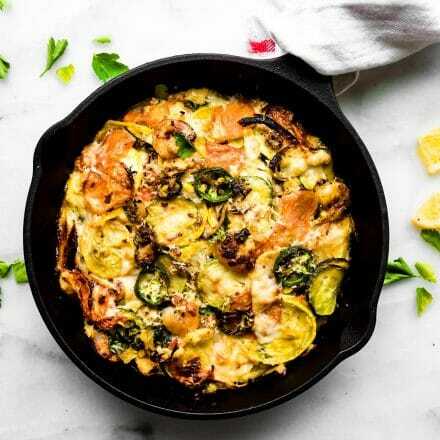 Seasonal vegetables, lean protein, herbs, and spices, all cooked in a casserole dish or cast iron skillet. 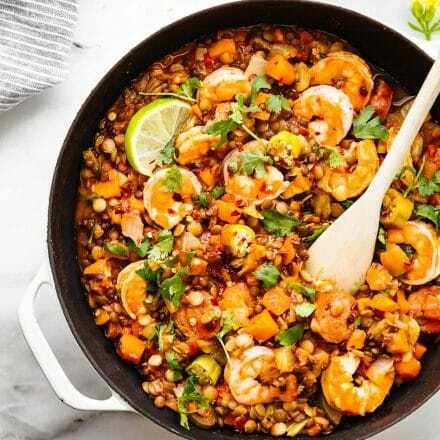 A better for you gluten-free and grain-free casserole with shrimp and veggies! This meal is a total crowd pleaser. 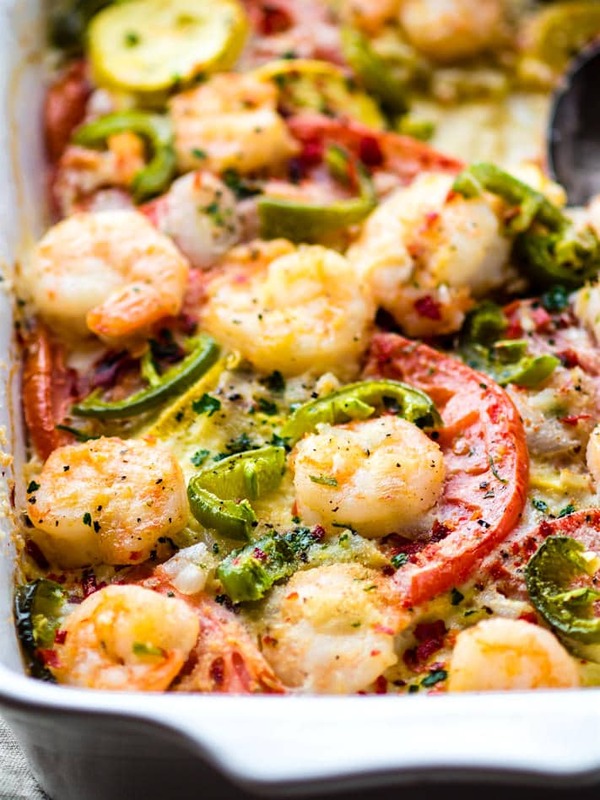 Just letting you know this Jalapeño Shrimp Veggie Bake recipe was originally published in early 2016. I retested, rephotographed, updated the content and URL. Now I am republishing it for you today! It’s a FAVORITE of ours! Thank you for following Cotter Crunch Y’all!. Two words that go together like peas and carrots. Jalapeño Shrimp. 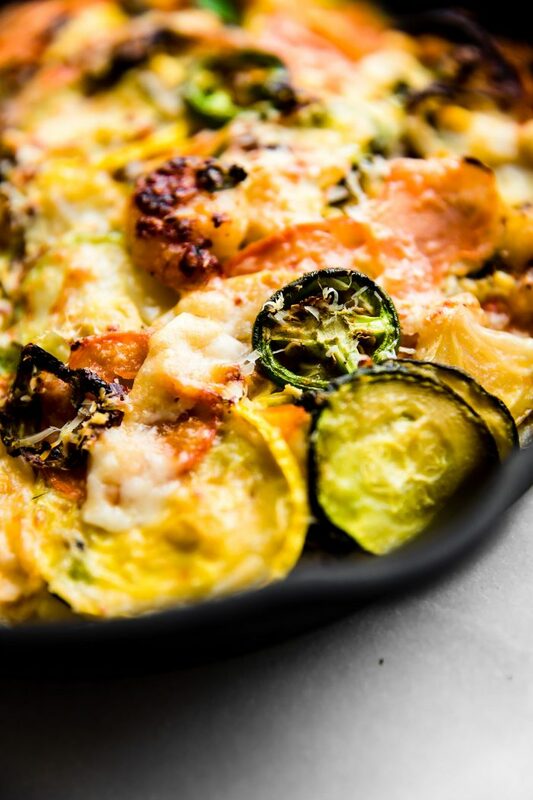 And… veggie bake. Okay, that last phrase really doesn’t, but if you’re southern (like me), then Jalapeño Shrimp. In fact, Jalapeño EVERYTHING is the phrase of life! Jalapeño mac and cheese, Jalapeño cheese crisps, Jalapeño Chutney, etc.. Ya ya, we like it HOT HOT HOT. Haha. Wink Wink. But here’s the thing. I married a man who also loves home cooked southern food and will eat fresh jalapeños as a snack (seeds and all). Though at the same time, he’s not a huge fan of shrimp. In fact, the only time he requests it is if it’s an Asian dish or spicy baked shrimp salad. Again, both have spice! I think you know where I’m going with this. I must MAKE it a goal to cook MORE shrimp recipes. Easy gluten-free shrimp dinners that I know EVERYONE will love (ahem… especially the Kiwi). Heck, if I can convince him to like asparagus after dressing it up with bacon, then dressing up shrimp with a little Jalapeño spice and buttery veggies should do the trick. Right? I know, I know. You’re probably wondering why I’m always so infatuated with getting my husband to try certain Americanish errr… southernish food. Especially my gluten-free creations with my seafood or my favorite vegetable. Well… I have a lot of time on my hands. Kidding! That is far from the truth. The truth is I’ve spent the past 10 years FUELING that man (as a nutritionist) so that he could be a pro triathlete. I was (am) a Sherpa wife and I loved every second of it!!! But now that he’s retired, I’ve put that Sherpa wife mentally towards creating this gluten-free food blog and making it my full-time job. And I still couldn’t do that without the help of my husband. So yes, he will continually be one of my main focuses and a much-appreciated Guinea pig! Haha. Capeesh? I am convinced that when you combine fresh produce with herbs, spices, a little bit of butter to create a VEGGIE bake MAGIC can happen! Magic as is in…. you can get your Non-VEGGIE loving family to actually eat veggies because it tastes so fresh and good. Gah, just look at that color. How can one not love it? So fresh and so clean. Back to my main point here. I guess I really have two missions for this Jalapeño Shrimp Veggie bake. Three if you count that it is a quick EASY meal (meaning under an hour). 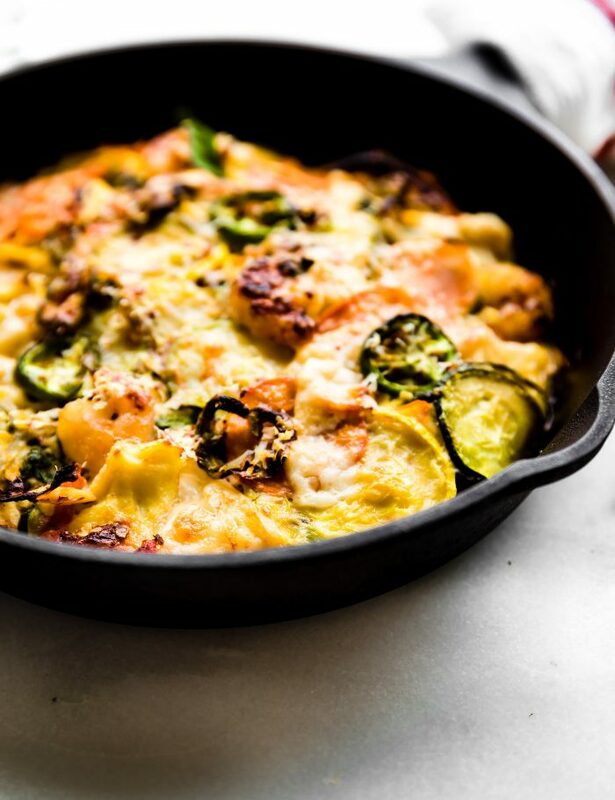 Convince my non-shrimp loving husband to LOVE shrimp by making a low carb spicy parmesan veggie shrimp bake he can’t resist. Convince non-veggie loving people that zucchini (or any squash in general), tomato, herbs, Jalapeño and real butter all baked together can make you want to eat the whole garden! Convince ANYONE that a healthy, grain free, protein-packed, veggie-filled dinner can be made EASY and in under an hour. Looks pretty simple and easy enough, right? 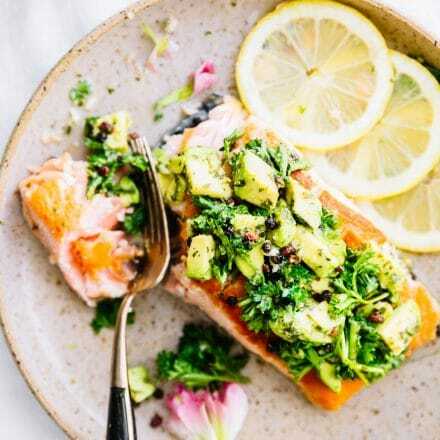 A great high protein and low carb dish that you can make ahead for meal prep, GO-TO dinners, or even make as a QUICKY post workout meal. Ya, you know I had to mention that. Real food makes those muscles recover quickly! A few tips! 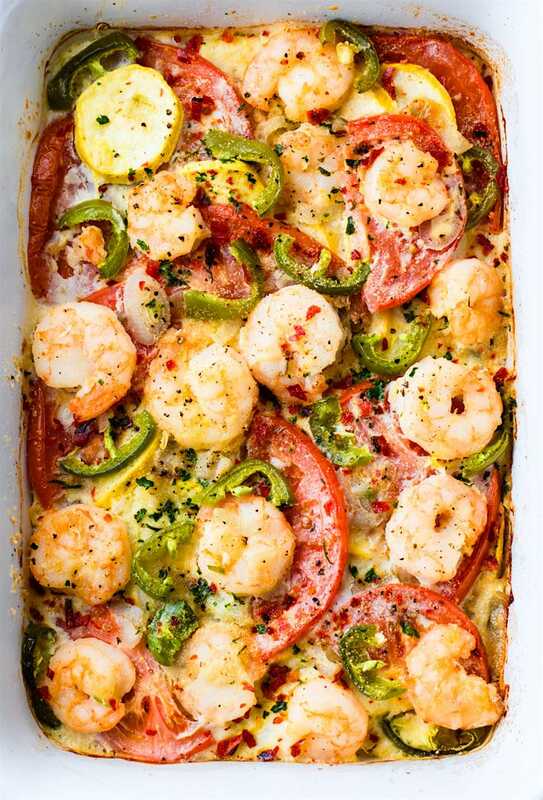 As you can see, this shrimp veggie bake can be made in a casserole or a cast iron skillet. Actually, any pan that you can bake with. It doesn’t matter the shape, it’s ALL GOOD! 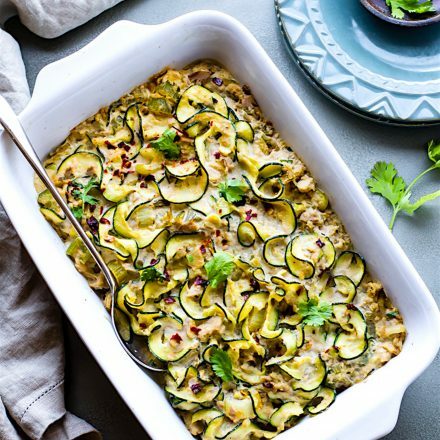 But what I think I like most about this veggie bake is that you easily adjust to your nutrient needs. Want to sub the parmesan and make it paleo/dairy free? No prob, just add nutritional yeast. 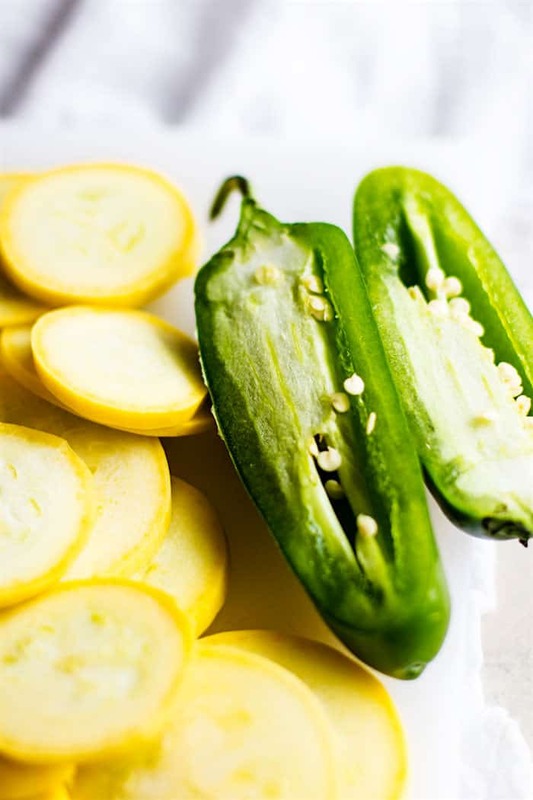 Don’t like zucchini or squash? You’re crazy. Just kidding (again). No prob, use eggplant, carrot, or sweet potato. Don’t like shrimp? Well.. sorry, you MUST! Nah.. you don’t have to. You can easily sub the shrimp for chicken, tofu, or sausage. But that would defeat my whole mission. 1/3 to 1/2 cup grated parmesan or nutritional yeast needing a dairy-free option. Feel free to add more for a cheesier topping if desired. Next, make sure all your veggies are sliced. If you want more flavor to the dish, lightly brown (dry sautée) your onion in the pan (until fragrant) first. 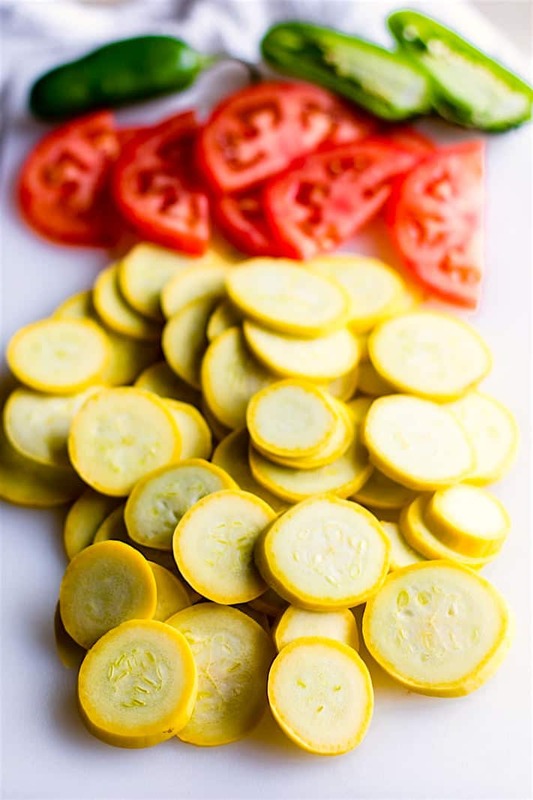 Then lightly oil or grease your pan and layer the rest of the vegetables evenly into the baking dish or pan (casserole dish or cast iron dish work great). Place Shrimp on top or mixed within the veggie layers. In a small bowl, mix your cream, garlic, egg, starch, and butter or oil. Whisk together until smooth yellow mixture is formed. Pour this evenly over your shrimp and veggie dish. Sprinkle your sea salt and black pepper over casserole dish followed by your grated parmesan, evenly. Place in oven and Bake at 350 Fahrenheit for 35-45 minutes, depending on your oven. Just want to make sure that your shrimp are cooked and your veggies are nice and tender. Check at 25-30 minutes to see progress. The shrimp will shrink while cooking. *NOTE* If you are using small shrimp, you might want to add them during the last half of baking to ensure they don’t overcook. The top should be a little golden brown due to the baked Parmesan. The eggs should be cooked through. Once cooked, remove and more sea salt, pepper, cilantro on top! Feel free to season with additional chili flakes as well. You can use nondairy butter or olive oil if desired but the taste and consistency might be a little different. Check around 25 minutes, as the veggies may cook faster. The egg/butter/cream mixture acts as a base, almost like a frittata. You will want to make sure that’s cooked through as well. If you find the consistency too runny, use less cream or one less egg. Thanks to a reader, Gail, for informing me about this. She used coconut flour in place of starch. It is in a ratio of 1/4 of the almond flour. So, in this recipe, you will use 2 tablespoons instead of 1/4 cup almond flour. Add a little extra liquid. You can also use corn starch for those sensitive to coconut. 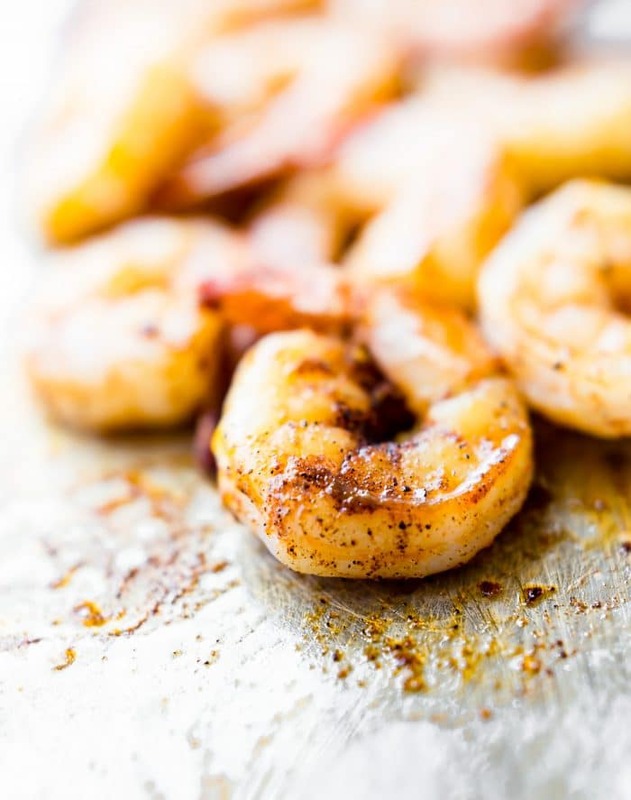 Besides, shrimp is also loaded selenium and vitamin B12 which can IMPROVE Your MOOD! See… we are all HAPPY! Now let’s dig in! 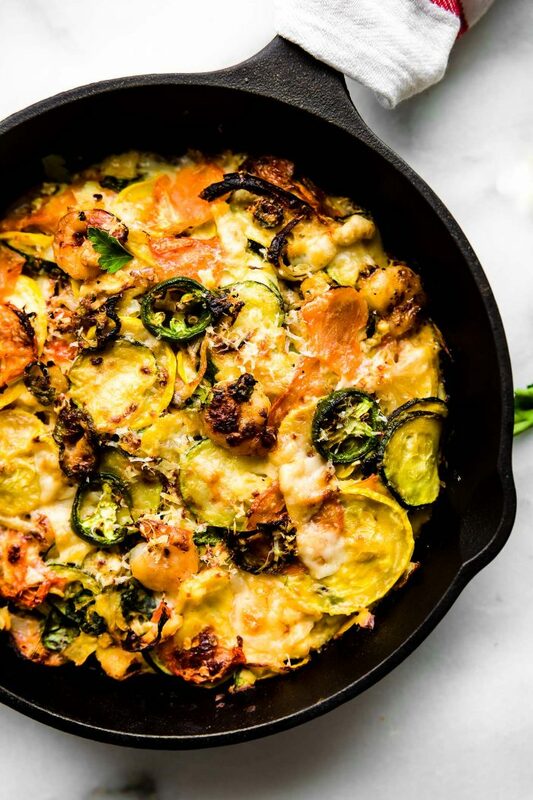 Yep, another Southern-ish style comfort food veggie bake with a healthy grain-free twist. And if you add 3 more sticks of butter, I’m sure Paula Deen will approve. Yikes! Favorite jalapeño dish? Let’s spice it up! What are Parmesan crumbles ? it’s just parmesan grated, finely. Does that make sense? a store bought container works! You can use regular cream, coconut cream, or even almond milk. I’d say coconut cream or regula cream make it more rich, if that makes sense? This recipe is DELICIOIUS but I cant find updated Macros on My Fitness Pal – (I like your new numbers MUCH more)? Thanks so much! You said shrimp. You said jalapenos, you stuffed it with Mexican spices and veggies. This dish is amazing! I just made shrimp on Monday! I haven’t been making it much. That definitely needs to change. OMG…your husband eating full jalapeños actually scares me! Hey Lindsay! I’ve been a little quiet lately but I’ve been reading. This recipe looks amazing! I need to get out and get the ingredients to make it asap! omg YUM! casseroles and bakes are the best because they make for the easiest leftovers!! Ohmigerd! 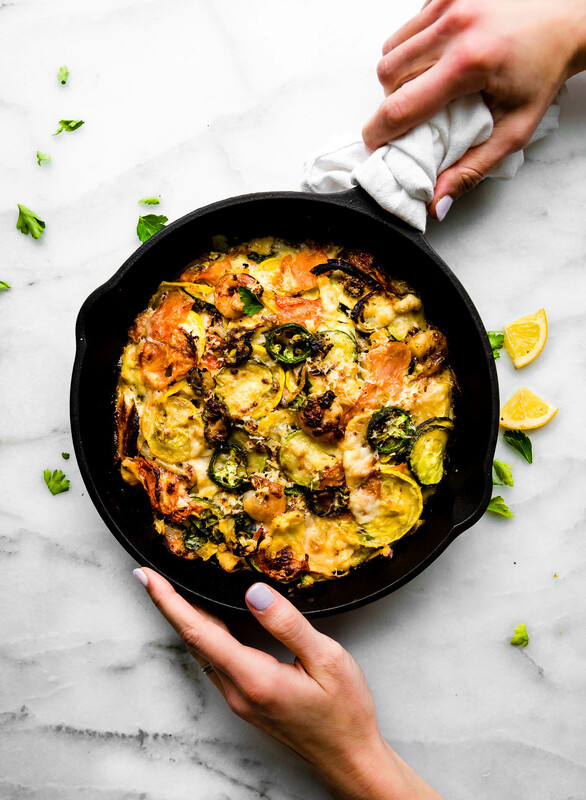 Not only is this casserole/frittata/quichy/egg bake thingy GORGEOUS, it’s filled with all of my favorite veggies from the garden, and SHRIMP! I mean, seriously… it’s like you channeled your inner “Boo” to make this. OH, and you made it spicy (YAY!) 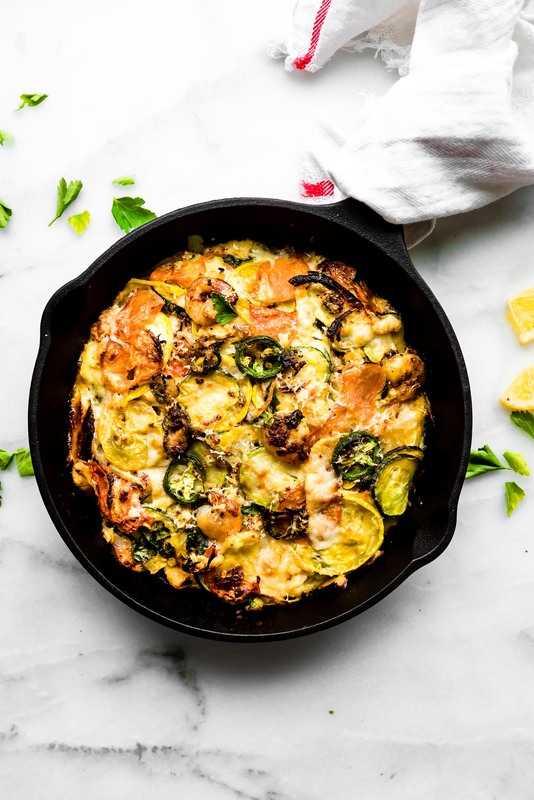 and then you went over the top for your friend Becca and you made this veggie bake LOW CARB. I know Kyle wishes I’d cook with shrimp more!! Shrimp is actually one of the only seafoods I can do cooked. Lindsay, I’ve lived in the south for more than 20 years and I hadn’t come across jalapeno shrimp – I need to get out of the rock I’m under! This bake sounds wonderful – so, can your kiwi eat habaneros like he eats jalapenos? I tried – but fire…burning fire…in ma mouf and belly and everything in between GAHHHH!!!! he sure has! although he almost died. haha kidding. Well, he loves peppers. Crazy! Kiwi sounds like Vegas. Except for the spice. I forget and make things to MY spice preference and she’s running for the milk (or beer, let’s be real). She’s totally be on board with this… we’ve been grilling out Sizzlefish shrimps more lately and that seems to go over well too. woohoo, keep me posted Ash! you’re funny. 😉 yea, whatever. casserole bake.. hot dish. It’s good! haha. I love shrimp. LOVE IT. Add spice and veggies and, uh, this is totally perfect. I’m super excited to give it a shot! woohoo! let me know if you try it ellen! That’s it–I TOTALLY have to try making this recipe! Shrimp is one of my absolute favorites, and using tons of veggies in an egg dish is always a must! well aren’t you clever. .. buddy! Haha. But now yo have me wanting this as a sandwich. with vegemite?? This recipe totally came at the right time! One of our friends just dropped over a bunch of bags of different chillis and a whole pile of jalapenos yesterday! Jesse will LOVE this! YUMMMMMMM! I love shrimp. I have almost all the ingredients for this dish. I might need to make it tomorrow. Jambalaya is one of my favorite shrimp dishes! you know it! jambalaya is fab too! let me know if you try this jen! This recipe looks so amazing. My go to veggies are peppers, asparagus and broccoli and cauliflower. that’s a great combo for sure! I love it when healthy food is as flavor-packed as this! 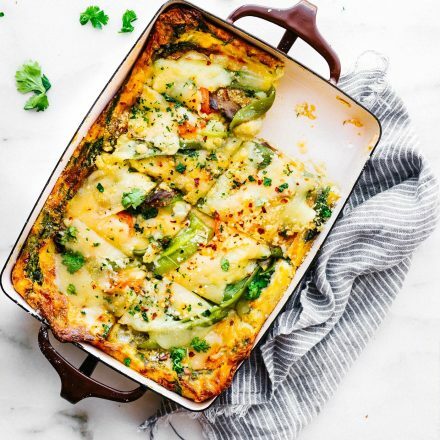 This is one gorgeous veggie bake! I was convinced by the looks 🙂 no argument there, shrimp and jalapeño are awesome together but eating whole jalapeños with seeds and all are far too spicy for me to handle. Awesome recipe! I so agree!! Best combo! Let me know if you try it Silvia! My bf isn’t a huge fan of shrimp either, which just means I eat his portion of all the skrimp dishes, ha! I’m loving this shrimp n veggie bake! I could see it being a huge hit at girls night, slash Julia’s night in when her bf is out of town 😉 Love it, want it! 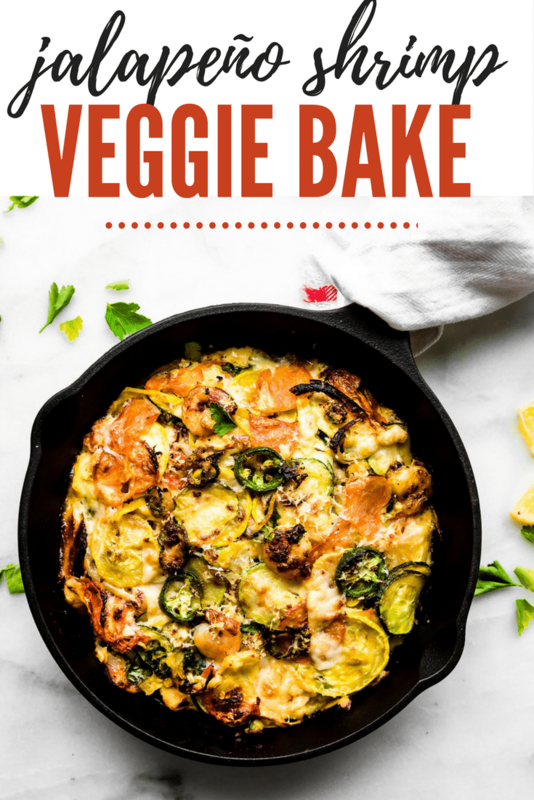 Love veggie bakes like this and I know my husband would love the spice! I need to try this soon! You quoted Outkast. My day has been made. Do you really cook the shrimp for 45 minutes? Isn’t it way over cooked? I think it just depends on the size of shrimp you use. I would check around 30 minutes, depending on if your veggies are done. Let me know if you try it! HELP! So I think I fudged up somewhere making this recipe (it’s currently in the oven!) Because the ingredients being mixed into the bowl were more of a cookie dough consistency instead of something that I could “pour over” the shrimp and veggies, so added another 1/3 cup of cream and an extra TBSN of butter (Paula approved, I hope!) But still didn’t help much. I just tried to spread as evenly as possible over the shrimp&vegg…currently hoping it will “Melt” into the rest. Any tips for the next time I attempt?! Oh no! So sorry! I would check the bake at 30 minutes. It might be a little runny but should bake. Keep me posted!! Just wish the number of servings were listed. Pinned this recipe on Pinterest. Tonight was the night that I made it and it was amazing. 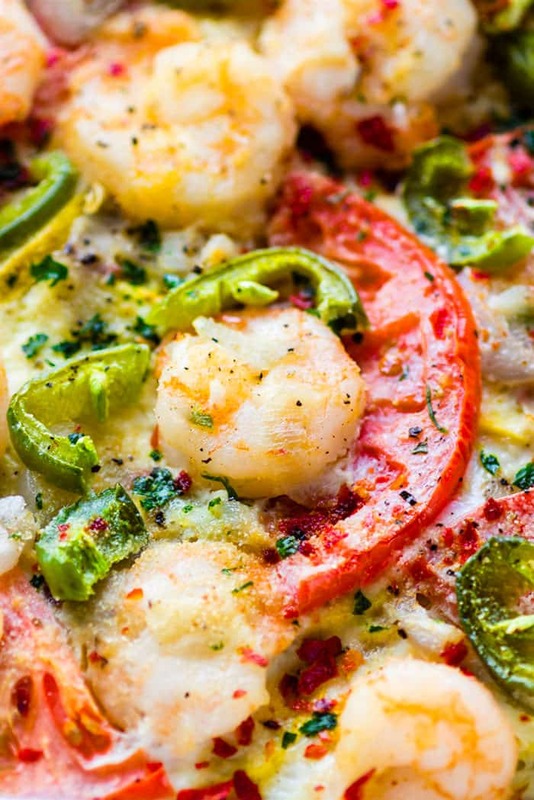 Love the combination of the all the veggies, especially the jalapeños, and shrimp. I did use coconut flour. When you use coconut flour in place of almond flour it is in a ratio of 1/4 of the almond flour. So, in this recipe I used 2 tablespoons instead of 1/2 cup. Added a little extra liquid, and it came out great. I have moved this recipe to my Favorite Folder. One to be made again and again and will try it with other veggies. Thanks for the recipe Lindsay. Oh wonderful Gail! Thanks for letting me know about the coconut substitutions. Do you mind if i put that in the recipe notes? Hi! I am looking forward to making this today. I could not however find almond flour. Can I use regular flour instead? Or leave the flour out completely? Thanks! Emily, did you end up using regular flour? Just wondering how it turned out. I cannot believe it took me this long to find your space here! Your recipes look fantastic and I am so excited to try this one! I am MS and am trying to lower my meat intake, especially red meat and have been on the hunt for some great recipes that aren’t full of gluten and dairy and I’m so excited I stumbled upon your site while looking for vegan mac and cheese! Thanks!! So glad to connect Danielle! Let me know if you have any questions or need any more recipes! Have you tried making this with regular flour? I don’t want to buy almond flour if I don’t have to but I don’t want to ruin the recipe either. This looks amazing! sure, the almond flour has more fat, so it takes longer to cook. If you use regular, just check for shrimp doneness and crispy topping around 30 minutes perhaps. Does that make sense? So I made this for dinner tonight and my husband and I both loved it! I used regular flour and heavy whipping cream. I mixed in the melted butter with the flour (so it wouldn’t scramble the eggs) then added the flour/butter mixture in with the eggs. I also added a bit more cream whisking to make it smooth. 30 minutes in the oven was all it needed. I sprinkled red pepper flakes, cilantro and a little bit of salt when it was done. Will definitely be making this again! Please Rush the answer. Family coming tomorrow. How can I incorporate already cooked peel and eat shrimp into this recipe? Two of them r Low carb. Hi rhonda! So what I would do is cook the veggies in the pan for 20 minutes, with the mix, etc. Then toss int he shrimp and cheese and cook for another 10. Just to warm it up and melt the cheese,, etc. Does that make sense? Keep me posted! This recipe is heavenly!!! My new absolute fav! Thanks for sharing! What do you mean by parmesan crumbles? Is that shredded parmesan or grated Parmesan? Oh thanks for noticing that. I used grated but shredded works as well. Hi! Sorry about that, what Parmesan did you use? Shredded or crumbles? Beautiful update, friend! I need to make shrimp more often. It’s so quick and easy – I’m not sure why I always forget about it! Lol! Love the veggies in there! I loved the shrimps + veggies. Absolutely delicious and healthy! I’m thinking about making this recipe tonight which flour did you use? I actually think corn starch or arrowroot starch work best. That’s what I usually use. Keep me posted! sorry about that. just updated recipe! It should be 2-3 tbsp. Let me know if you see that in the notes now. This recipe looks delicious! Are there any recommendations for egg substitutions in this particular dish? So I made this for dinner tonight and my husband and I both loved it! I used regular flour and heavy whipping cream. My husband doesn’t like squash or zucchini so I used broccoli and mushrooms. He loved it. I would definitely make it again. wonderful! I’m so glad. I”ll have to try that Ellie! awesome! So glad you approve craig! Hi! How much regular AP flour would I use in this recipe? Thanks! Cooking is one of my hobby which I love doing it. Trying out new recipe and cooking food for my family is what I love to do. Thanks for this recipe gonna try it out for dinner tonight. This looks amazing I’m going try making this for lunch tomorrow! It’s one of my favorites 😋 let me know how it turns out!